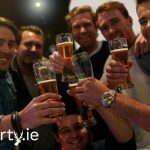 Dublin Stag Party Packages from just €69 pp ! Dublin never ceases to be one of the best stag party spots in Ireland. The options are endless and we’ve put together some fantastic options in Dublin City Centre. Firstly, your accommodation is in the middle of Dublin City Centre in a stag friendly hotel with a residents bar. So, cheers to that! Afternoon of Sports: Watch sportson big screensin the comfort of the pub! Stag Vs Food: Think you could take down Ireland’s biggest pizza? Find out if the stag can make the wall of fame! Footdarts: A combined sport of football and darts. Aim of the game is to hit the giant sticky board. Includes multiple competition rounds and of course an aim for the bulls eye competition. Joker balls are added to each round for an extra challenge. Pub Crawl: Enjoy a guided pub crawl consists of four stops with live music, drink promotions and will end with free entry into a night club. Dodgeball & Tag Rugby: 60 minute activity. Two great high energy games. Keep things moving and switch up the games during the session, this will really get your adrenaline going. The perfect icebreaker for your day! Olympic Sports Day: Throwback to your youth, old school sports day with all the favourites like egg and spoon, sack race, three legged race, pipe race, Horse shoe throw, Pillow bash, Team relays including our new relay with the Giant Connect. All the usual races, participants can be competitive or just have some light hearted fun. 5-a-side soccer: We can arrange this if you prefer playing than watching it. Buggy Racing: is a completely new activity to try for your Stag activity! Goggle Football: This is a hilarious new stag party activity that sees you try and play football with Goggles that make the ball seem further away or closer to you. Prepare to be kicking air and watching you mates falling over. Karting: Enjoy a podium presentation with this adrenline pumping activity. Paintball: Another fun activity for your group to enjoy! Jameson Distillery – Take a tour and have a drink! Whiskey Tasting Evening – if you prefer to taste instead of tour! Karting and Paintball: So, if you can’t decide which to try first why not do both! Boat Trip: Relax and enjoy the views of Dublin Bay with your Stag party. GAA Experience: Enjoy a variety of GAA sports including short stick hurling and Gaelic football. Plenty of high energy competitive fun to keep the group entertained. Zip Wire: Get your heart racing while zip lining for your stag. So much fun lads! 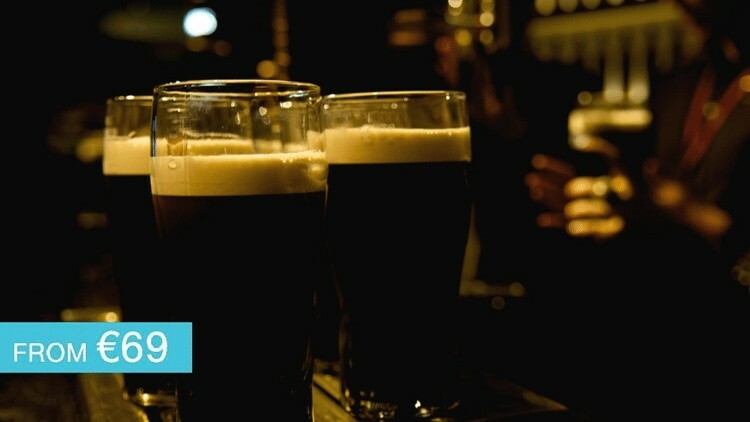 Ever wanted to visit the Guiness Store House? Well now you can! Ski/ Snowboarding Session: Try something unique for your Stag party in Dublin! Night at the Dogs: A fun activity to do for your Stag activity! Casino Night: Raise the stakes with this activity for your Stag Night! Bubble Soccer: Zorbing while playing soccer….the latest craze to hit Europe! Viking Splash Tours: take in the sights of Dublin with this fun activity! Paddle Boarding: try something different with this activity for your Stag Party! Clay Pigeon Shooting: This is a great activity for all ages, something to suit every one in your group! Rafting: A great activity to do on the Stag! Perfect for those that love the water! Comedy Club: So why not make sure of a good laugh for your Stag Party by heading to a Comedy Club! City Kayaking: enjoy a trip along the River Liffey taking in the sights and sounds from the water. Skill Zone Session: This is a 90 min activity that incorporates 10 different sports and participants have between 1-12 attempts at each sport aiming to get 100 points. (Min 8 people). Forest Adventures: fun activity for all the serious adrenaline junkies! Artisan Brew Academy: Groups learn the beer making process and make beer themselves. And, groups get to personalise the beer labels to say e.g. ”Brian’s Stag 2018” and get the labelled beer delivered in bottles to their home. Hurling OR Gaelic: Choose between these 2 great activities for the Stag! Mountain Biking: For the adrenaline junkies out there! Fantastic activity to try. Segway Polo: No horses, two teams trying to score against each other. Warm up with a game of Segway Frisbee and Segway Nerf gun battle beforehand. Bar Crawl Beauties: Spend the stag night with ladies chaperoning you around the best bars and nightclubs, including free drinks entry and more! Close Quarter Battle: Is a close quarter Airsoft battle where teams play against each other to win games. Games include ‘Capture the Fort’ and ‘Protect the high value target’. This action packed activity last 2 hours and you’ll need a minimum of 6 people. Axe Throwing: Enjoy axe throwing where a dedicated ”axepert” will take your group through all the techniques. Groups battle head to head, aim of the game is to hit the target. We have food lined up for your group in a top city centre pub. And if that weren’t enough, a round of shots has also been organised in a top Dublin pub for your group. And at the end of the night we have entry and a round of shots in one of Dublin’s top city centre clubs!